This is a Drill-Less Mudflap, approximately 14 inches wide by 3/8 inch thick. Designed to hang approximately 10 inches below the fender well. This is a Drill-Less Mudflap, approximately 14 inches wide by 3/8 inch thick. Designed to hang approximately 12 inches below the fender well. Application: FRONT of all full-size Dodge 2003 to 2009 pickups with a leveling kit or lift and extra wide tires. If your truck is a Power Wagon, we do have a drill-less mudflap to fit, but let us know on the order form & we will send you the correct mudflap. This is a Drill-less Mudflap, approximately 12 inches wide by 3/8 inch thick; designed to hang approximately 11 inches below the fender well. Application: REAR of all full size Dodge 1994 thru 2002 2500/3500 pickups with stock wheels and flares. Call if your flares are not stock. Call if you have a 1500. Application: REAR of all full size Dodge 1994 thru 2002 2500/3500 pickups that has been lifted, or requires protection of a towable. Call if your flares are not stock. Call if you have a 1500. This is a Drill-less Mudflap, approximately 14 inches wide by 3/8 inch thick; designed to hang approximately 11 inches below the fender well. This is a Drill-less Mudflap, approximately 14 inches wide by 3/8 inch thick; designed to hang approximately 13 inches below the fender well. Application: REAR of 2003 thru 2009 Dodge Ram. If your truck is a Power Wagon, we do have a drill-less mudflap to fit, but let us know on the orderf form & we will send you the correct mudflap. This is a Drill-less Mudflap, approximately 12 inches wide by 3/8 inch thick; designed to hang approximately 14 inches below the fender well. Application: REAR of 2003 thru 2009 Dodge Ram. If your truck is a Power Wagon, we do have a drill-less mudflap to fit, but let us know on the order form & we will send you the correct mudflap. Application: REAR of 2003 thru 2009 Dodge Ram with lift and/or extra wide tires and wheels or where added protection to towable is desired. If your truck is a Power Wagon, we do have a drill-less mudflap to fit, but let us know on the order form & we will send you the correct mudflap. This is a Drill-less Mudflap, approximately 14 inches wide by 3/8 inch thick; designed to hang approximately 15 inches below the fender well. NOTE* Trucks with tires extending more than 1″ beyond fender, phone in order. Application: REAR of 2003 thru 2009 Dodge Ram with lift and/or extra wide tires and wheels or where added protection to towables is desired. If your truck is a Power Wagon, we do have a drill less mudflap to fit. Just let us know on the questionnaire & we will send you the correct mudflap. If your truck is a Power Wagon, we do have a drill less mudflap to fit, but let us know on the order form & we will send you the correct mudflap. 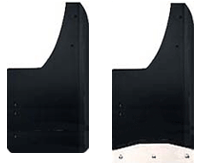 This is a Drill-less Mudflap, approximately 12 inches wide by 3/8 inch thick; designed to hang approximately 12 inches below the fender well on a 4WD and hang approximately 8 inches below the fender well on a 2WD. Application: REAR of 2016 to current Dodge Ram. Application: REAR of 2010 to 2015 Dodge Ram. This is a Drill-less Mud flap, approximately 12 inches wide by 3/8 inch thick; designed to hang approximately 14 inches below the fender well on a 4WD. Application: REAR of 2016-current Dodge Ram that has been lifted, or requires protection of a towable. Application: REAR of 2010 to 2015 Dodge Ram that has been lifted, or requires protection of a towable.